All the functions of AquaSnap can be assigned to a keyboard shortcut. To configure the keyboard shortcuts, double-click on the tray icon, at the bottom-right corner of the screen, and click on Hotkeys. 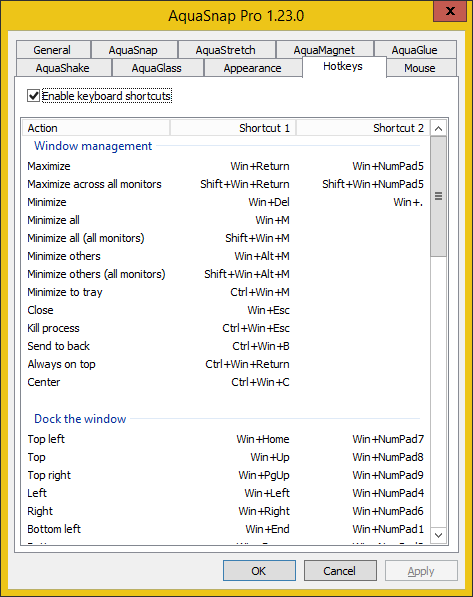 Enable keyboard shortcuts: if enabled, the AquaSnap keyboard shortcuts are active and can override the keyboard shortcuts defined by Windows or by other applications. The default value is enabled. Keyboard shortcuts: this is the list of the available keyboard shortcuts. Double-click on the keyboard shortcut that you want to change. Use the small popup window to configure the keyboard shortcut.